Made of high quality, weather-resistant stainless steel, this ultra-handy accessory with its dual spring gates will hold, secure, and connect everything from house keys and cell phones to technical camping gear. Attach valuables to the center bar for ultimate security, link gate ends to a second set of items and anchor, or connect many items together. This medium-sized S-Biner #3 works great for hanging items from a backpack strap, or luggage, and works well for bigger jobs like hanging a paint can from a ladder or a tool to your tool belt. The DoohicKey FishKey Key Tool is a fish-shaped tool that attaches to your key ring using a stainless steel S-Biner, so it's always at hand when you need it. This product's clever design incorporates a flat-head screwdriver, a serrated edge (great for cutting line and opening lure packages) and, finally, of course, a bottle opener (because you always want a bottle opener!). Made of durable stainless steel, the DoohicKey FishKey Key Tool is travel and airport friendly. S-Biner Stainless Steel Double Gated Carabiner #3 Made of high quality, weather-resistant stainless steel, this ultra-handy accessory with its dual spring gates will hold, secure, and connect everything from house keys and cell phones to technical camping gear. Attach valuables to the center bar for ultimate security, link gate ends to a second set of items and anchor, or connect many items together. This medium-sized S-Biner #3 works great for hanging items from a backpack strap, or luggage, and works well for bigger jobs like hanging a paint can from a ladder or a tool to your tool belt. 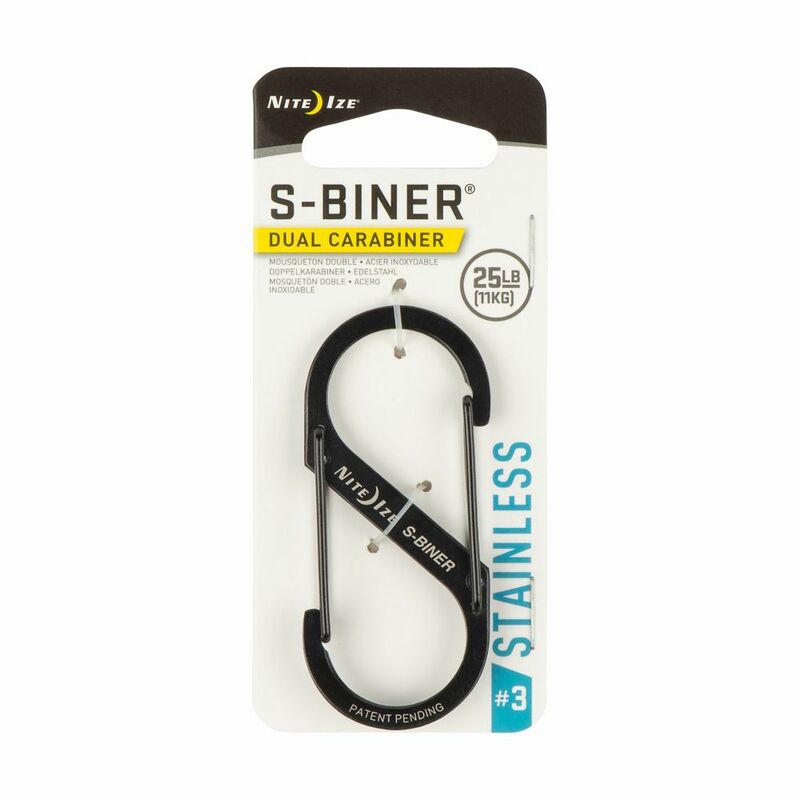 S-Biner Stainless Steel Double Gated Carabiner #3 is rated 4.6 out of 5 by 19. Rated 5 out of 5 by SJK from It worked perfectly and easily.... It worked perfectly and easily. Rated 5 out of 5 by Softballer from Used these for temporary installation of a windscreen on a... Used these for temporary installation of a windscreen on a backstop. Worked very well. Rated 5 out of 5 by Nicholas from Has not warped or stretched from original shape.... Has not warped or stretched from original shape.